“Chan Sheung 陳相 Affidavit photos,” 1929, Chinese Exclusion Act case files, RG 85, National Archives-Seattle, Yee Shee case file, Seattle Box 1155, 11627/3-3. Yee Shee, age 27, arrived at the port of Seattle on the Princess Marguerite on 28 September 1929. Her admittance status was “wife of merchant.” She was accompanied by her husband, Chan Sheung 陳相, and daughter, Chan Git Oy, age three. 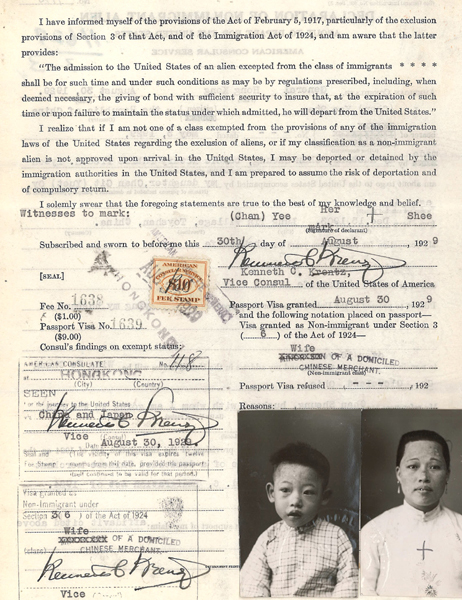 Yee Shee’s paper work consisted of a U.S. Consular certificate, an affidavit with photos of her, her husband and daughter, signed by her husband and sworn by a Washington State notary public; a Declaration of Non-Immigrant Alien sworn by Kenneth C. Krentz, Vice-Consul of the U.S. at Hong Kong; and Visa No. 118. Yee Shee’s interrogation describes her family, her husband’s family, their village and home—six pages in all. When Chan Sheung returned to China from the U.S. in May 1929 he brought with him an American trunk, suitcase, sea bag, one box of laundry soap and some eatables. Their first son died shortly after his birth. A woman doctor, Dr. Look Ooh, attended Yee Shee for the birth of her second child. Their daughter, Chan Git Oy, born 17 June 1926 was accompanying them to the U.S.
Yee Shee described their trip to the United States: they left the village about 7 a.m. and walked to the landing, took a row boat to Chung Sar market, transferred to another boat to Bok Gai, then boarded a steamer to Hong Kong. They were in Hong Kong a little more than two weeks at the Ung Nom Hotel, room number 13 before sailing for the U.S. While in Hong Kong they went to see a Chinese show and made several trips to the American consul to get the necessary forms and photographs. The testimony of Chan Sheung (marriage name Chan Leung Park) was also six pages long. He stated that he was 31 years old, a salesman and member of the Wing Wah Chong Company in Cleveland, Ohio. He first came to the U.S. at San Francisco in July 1912. He had made three trips to China since then; once as a student, then as a laborer, and currently as a merchant. Chan Sheung described his family in great detail. The village of Sam Gong had nine houses and one lantern house. Their home, which he inherited from his father, was “a regular five-room brick building; tile floor in every room; court is paved with cement; two outside windows in each bedroom with five iron bars, wooden shutters and glass door in each window.” There was an alarm clock on the table in the bedroom and several photographs hanging on the west side wall of the sitting room. The village had a brick wall about six feet high at both ends with bamboo trees in the back. A granite stone road ran in front of the village. Beyond the road was a stream where they obtained their household water. After lengthy interviews of Yee Shee and Chan Sheung there were only a few minor discrepancies—the exact houses their neighbors Chin Yoon Ying and Chan Wee Lee lived in the village; the number of suitcases they had when they left their village; and Yee Shee forgot that her husband bought her a brown purse in Hong Kong. The inspectors asked Yee Shee about these inconsistencies and her new testimony agreed with her husband’s statements. They were admitted to the United States. “Yee Shee Visa Application” 1929, Chinese Exclusion Act case files, RG 85, National Archives-Seattle, Yee Shee case file, Seattle Box 1155, 11627/3-3.